Wellness, Blue, Solid Gold, Precision, Natural Balance, Orijen are top cat foods with no garbage added. The foods you listed are pure cat poison. Grandma Mae's ingredients look to be about the same as the other higher quality cat foods. 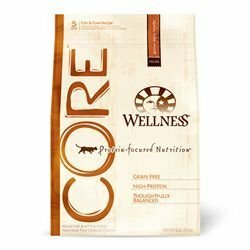 Anytime you can see less grain or no grain, I think your cat gets more of the essential things like meat protein and minuscule amounts of fruits and veggies. Don't let any of these bags fool you. The company only needs to add one cranberry or blade of barley per bag to be able to list it as an ingredient. Always supplement with ingredients from Dr. Pitcairn's book or Feline Future's dot com formulas. There are many supps cats need that just are not plentiful enough even in the better quality cat foods. Cut up some raw liver, chicken gizzards etc as a nice treat. When cats chew on cartilage, it is like a dental floss that they don't get from silly products like Greenies. Greenies are waste product material touted as something special. Avoid them. What about Grandma Mae's Country Naturals all natural cat food? They do not add corn, wheat or soy into their premium cat food which often may cause common food allergies in cats. They strive to make allergy free cat and kitten food.